You need to stop networking. Your networking is actually having a negative effect on your job search, career building, or entrepreneurial efforts. If you stop networking and start doing this instead, I can guarantee better job openings, career growth, and opportunities than you’ve ever experienced before. Think I’ve completely lost it? Ready to rain fire and brimstone in the comments section on this article? Well, let me tell you what’s wrong with networking and what you should do instead. First, What’s Wrong with Networking? To link (machines, especially computers) and operate interactively.”networked workstations. Beginning to see any issues here? There my friends is the networking kiss of death. So much of our networking attempts are about our agenda and personal pain points that we’re trying to quickly alleviate. I opened up a Tutti Fruiti Frozen Yogurt shop and need me some people to eat it up. The problem is most of us network only when we need something. Then we become that guy who’s roaming through the halls giving off that nervous tinge of desperation, and then the moment there is a lull in conversation he thrusts his business card in there like dead rat. Alright Paul, but don’t most job opportunities come through people? Definitely. Many of us have seen the stats that an estimated 70-80% of all job opportunities come through relationships, which I totally dig. But let’s stop networking to make it happen. Let’s start relationshipping instead. So much of networking is about us, when building relationships should be focused on them. It will be more human, and in turn, much more effective. Start implementing a practice and habit of getting to know new people, even when you have no specific “need” to do so. Be open to new conversations. Don’t fill every awkward space of your day with your phone pretending those around you don’t exist. I can point to many of the biggest breakthroughs of my career happening because I had no agenda, and just awkwardly wandered around. Luckily, I excel at awkward. I have a good friend who I consider a master conversationalist. He’s someone you can’t wait to speak to and be around. And if I had to boil down his secret conversational sauce to just one thing, I would say he’s just really good at being excited about the person in front of him. When I asked him for his secret to being so good at conversations, he told me that when he goes into a conversation he intentionally tries to have the person in front of him talk first for at least 10 minutes before he says anything about himself. Stop parachuting into conversations and holding every minute hostage with all the things you’re passionate about. Instead, start getting excited about all the things the person across from you is passionate about. Send a text. A quick email. Make a call. Check in on people. In our hyper-active social world, the intentional “wanted to see how you are doing” message with no favor to ask at the end, can go a long way to building a strong relationship. The most powerful relationshipping tool you have is a well-placed, meaningful compliment. When reaching out to a fellow alumni from your school. When asking to write a guest post for your favorite website. When trying to connect with someone through Twitter or LinkedIn. No matter how big of a deal a person is, they will pay attention to someone who has noticed their work and has something nice to say about it. Not a fake, cliche, general compliment either about them being “amazing.” It needs to be something specific. Do some research. Find an article they’ve written. Study a project they were involved in. Find a recent promotion on LinkedIn. Don’t shout at a person, shout about how cool that person is. Bonus Tip: Please for the love of humanity, at least lead your email with the person’s name. I can’t tell you how many emails I get from people that say they love my site and want to write for it, but they never actually use my name in the email. And they never actually say “All Groan Up.” This screams to me spam, stock email you’re firing out to as many people as you can find. Holster that email cowboy before you start hurting people. Every time you check your phone across from someone you’re telling them that your phone is more important than they are. Think of two people in your life right now who don’t know each other, but would benefit from connecting with the other. Send a quick email connecting the two, with specific, meaningful compliments about both people. Now you’ve just accomplished a 2-1. 7. How can you help them? Relationshipping doesn’t mean there aren’t some self-serving interests involved in connecting with people. But we don’t let those interests be the driving force or motivators behind connecting with people. Let people be the focus of connecting with people. 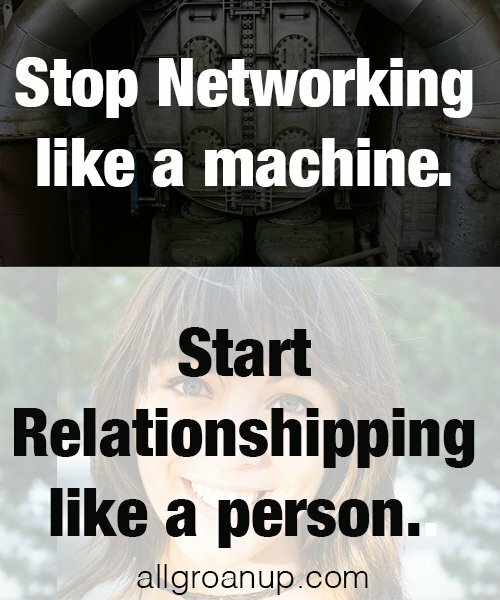 Stop networking like a machine. Start relationshipping like a person. What do you think? I’d love to hear from you within the comments on this article.